Welcome to Day 1 of the Herbs and Spices Summer Series! The incredible healing power of herbs and spices has intrigued me for years. I have studied Ayurveda, Eastern and Western herbs and spices passionately since I was a teenager. I use herbs and spices daily for boosting my immune system (as well as that of my family’s) and warding off viruses that always abound at my daughter’s Preschool. If you have young kids, work in an office and/or are easily stressed, I highly recommend incorporating herbs and spices into your diet. Astragalus is a member of the legume family. The root of the plant is used in herbal medicine. It is great for people who have fatigue, frequent infections, suppressed immune systems (such as cancer, diabetes and lupus) as it stimulates the immune system. Astragalus increases the body’s production of the immune-system chemical interleukin-2 (IL-2). Furthermore, it helps the macrophages(which are immune cells that kill of viruses) become faster and more efficient. Additionally, astragalus increases the immune system’s production of interferon, which in turn stimulates the creation of proteins that prevent viral infections. Cat’s Claw is a plant native to Peru that also happens to be in the same family as coffee. The bark of the plant is used in herbal medicine. Cat’s claw is an anti-inflammatory agent and immune stimulant. I must say Cat’s claw is a pretty amazing herb. It decreases the total number of macrophages if they are overabundant and increases the number of macrophages if they are deficient. It also increases white blood cell count if it s below 4,000 and then decreases white blood cell count if they are above 9,000. Echinacea (also called purple coneflower) is used extensively to boost the immune system, treat colds and flu, fight infections and reduce inflammation. The plant is famous for its purple flowers that commonly grow on the prairie. Echinacea activates natural killer (NK) cells which are a critical class of white blood cells. It is important to note that echiniacea should be used only for short periods of time to boost the immune system as studies have shown it does not seem to strengthen the immune system when taken for long periods of time. When echinacea and goldenseal are used together, they increase the body’s production of immune globulins that attack bacteria and viruses. Please note that individuals who are allergic to plants in the sunflower family should avoid echinacea. Elderberry is a deciduous tree that is found all over England. It stimulates the immune system and helps fight viruses. It contains substances called Sambucus nigra agglutinis (SNAs) that can “lock” receptor sites on specific strains of flu viruses. This prevents the viruses from getting into the human cells. Elderberry is best used in the form of Sambucol, a patented herbal medicine that is active against various strains of viruses. Ginseng is a plant that grows abundantly in China and North Korea. The root of the plant is used commonly in herbal medicine. Ginseng is an adaptogen that increases the body’s ability to tolerate stressful situations. When ginseng is combined with echinacea, it increases the activity of natural killer (NK) cells, an important immune system component. Goldenseal is native to North America and the root of the plant is used often for medicinal purposes. It is a well known immune booster and a great antibiotic when used topically. Goldenseal contains berberine, which helps fight bacteria and fungi. Pau D’ Arco is a tree that grows in the Amazon. The tree’s inner bark is an immune stimulant and is effective against bacterial, fungal, parasitic, viral and yeast infections. Pau D’ Arco is an anti-inflammatory agent that stimulates the immune system to produce macrophages which helps rid the body of bacteria and yeast. Scutellaria (also known as skullcap) is native to China and Siberia. The root is used for medicinal purposes and kills bacteria and viruses. Scutellaria shuts down the replication process in flu viruses and helps fight off many other viruses as well. A unique property of this herb is that it does not stimulate the immune system, rather it acts against the viruses themselves. Scutellaria is great for people who have autoimmune diseases, such as rheumatoid arthritis. St. John’s Wort grows abundantly in northern Europe. The entire plant is used in herbal medicine. It has antibacterial, antidepressant, anti-inflammatory and antiviral properties. Turmeric is a plant of the ginger family and grows abundantly in Asia. It is an antioxidant with powerful anti-inflammatory abilities thanks to its active ingredient curcumin which has been show to protect and improve the health of almost every organ in the body. The root of the plant is ground up into powder. Turmeric is found in curry dishes and is often used to color food, such as cheese and salad dressing. These herbs can be used in teas, tinctures and capsule form. Turmeric can be sprinkled on any dish, but is especially tasty on chicken, rice, quinoa, temeph, turkey and veggie dishes. I highly recommend taking this turmeric daily to increase your antioxidant levels and optimize your immune system. Two herbal formulas I particularly like are Planetary Herbals Echinancea–Goldenseal with Olive Leaf and Herbs for Kids, Echinacea/Astragalus. As always, please consult your doctor before taking any herbs or spices for health ailments or illness. This was shared on Wildcrafting Wednesday and Allergy-Free Wednesdays. Herbal Medicine has been a passion of mine for many years. I had the pleasure of studying herbs and raw foods with the amazing Brigitte Mars when I lived in Boulder, Colorado. If you are at all interested in the numerous benefits of raw foods, I highly recommend Rawsome!. I have a hand-signed copy that has been in my kitchen for 8 years. I suppose you could say I will forever be a student of Herbal Medicine and nutrition as I am always reading and learning as much as I can on the subject. Needless to say I was VERY excited when Mountain Rose Herbs asked me to review some of their products and host a giveaway for you lovely friends! Mountain Rose Herbs, based out of Eugene, Oregon, is a company dear to my heart. I have the utmost respect for their business practices and commitment to their customers and the environment. They recently sent me four products from their Epicurean Organics line of organic seasonings, oils, peppercorns and salt to review. I was sent Rainbow Pepper Blend, Herbs de Provence, Grilling Herbs & Cajun Spice. All ingredients in this line are organic, non-GMO and grown without chemical herbicides or pesticides. 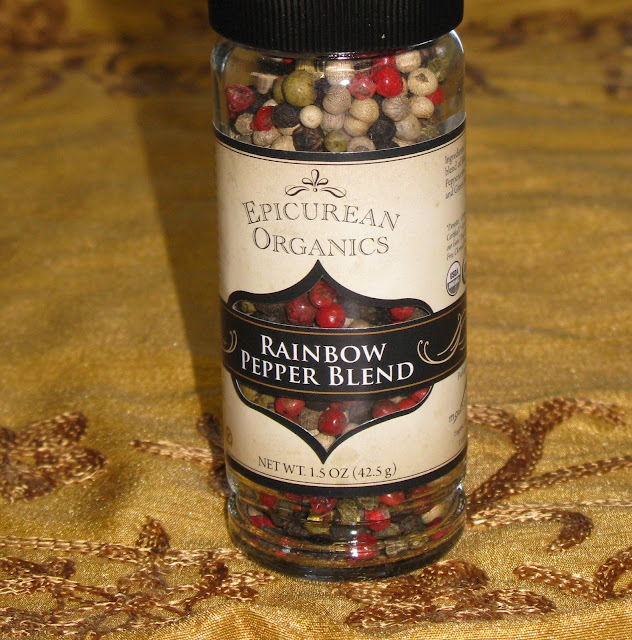 Rainbow Pepper Blend is a 100% certified organic blend of black, white, pink and green peppercorns. Pepper goes on most of the savory recipes at our house. I loved the gorgeous pepper colors in this bottle and the colors they bring to the dishes I made. There is nothing quite like fresh cracked pepper over a bowl of soup or risotto! Herbs de Provence– A blend of thyme, rosemary, marjoram, lavender and organic herbs. I don’t think I have ever tasted such a fresh dried herb blend in my life! The rosemary and lavender in this mix are simply heavenly. Grilling Herbs– A blend of garlic, rosemary, black pepper, thyme and organic herbs. This blend has a little kick to it, which made it perfect for rubbing it on chicken and veggies this past weekend. It is my favorite of the four, although we really love all of them. Cajun Spice– A blend of organic herbs, organic spices, garlic, onion and cumin. This mix is mildly spicy with exquisite taste. I put this on baked salmon and it was a huge hit. The winner of this giveaway, will be mailed all four of these products directly from Mountain Rose Herbs. Please check out their fabulous website–their products really are stellar! To enter the giveaway, leave me a comment letting me know which spice or herb is your favorite. For a third entry, follow me on Twitter and leave me a comment letting me know that you did (or let me know that you are already a follower). For a fourth entry, follow me on Pinterest and leave me a comment letting me know that you did (or that you already do). For a fifth entry, sign up to follow me by email. This giveaway closes on May 2, 2012 at midnight. The winner will be selected from random.org and announced the first week of May. Good luck! Disclosure: Mountain Rose Herbs sent me these products to review. All opinions shared about Mountain Rose Epicurean Organics are 100% my own. This is linked to Wednesday Giveaway Linky, Real Food Wednesday, Fat Tuesday, Monday Mania and Mix it up Monday.